Last summer, I went to see the movie Captain Fantastic. 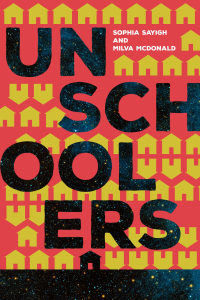 There was much I enjoyed about it, but I also took issue with its portrayal of homeschooling. I wrote about my thoughts in a review. Several commenters disagreed with my interpretation of the ending, so I took another look. After re-watching several times, my initial perception has not changed. I don’t see that the film’s conclusion is open ended or ambiguous. Ben Cash’s kids go to school. Some argue that the ending is sarcastic. One piece of evidence for this reading is the way the older daughter looks at her father when he tells the kids the school bus will arrive in fifteen minutes. It’s flimsy evidence, at best. The look could mean any number of things. The evidence that they are going to school is more substantial and easily overrules the mysterious teenager look. Dad tells them to get ready to board the school bus, and he’s packed individual lunches for them in brown paper bags with each of their names written in black marker. Another reader reasoned that the kids are going to rebel and not get on the school bus. It is true that we don’t see the bus arrive, and we don’t see the kids get on it. Given that, one could argue that it’s an open-ended finale that lets the viewer decide. Even if I thought that were so, do we really think the vast majority of viewers is going to think anything other than the dad finally came to his senses and sent the kids to school? Homeschoolers who bring an entirely different viewing perspective to the movie may come to different conclusions, but to the vast majority of moviegoers, the ending is a nice, tidy compromise. The family moves to a nice little farm, they still get their exposure to nature, and they join the ranks of society by going to school. I wanted the end to be different, too. When I saw the kids running happily around the farm, collecting eggs, I thought that was the compromise, and that they would continue homeschooling, just not in isolation. The school thing was a big disappointment, but that’s what happened. I can’t pretend otherwise. There’s no mention directly of the kids going to school, but Mortensen alludes to giving the kids a chance to interact with society and other people. In our culture, kids interacting with society means one thing: school. One major stereotype of homeschoolers is that they are socially isolated, a stereotype that this movie did nothing to dispel. We homeschoolers know that homeschooling could absolutely have been part of the “new balance” Ben Cash struck, but that’s not what the filmmaker chose to portray. I still haven’t seen that movie yet, mostly because of your review. I have a feeling it will make me furious. I just watched it yesterday. I found it amusing. Obviously, exaggerated. And, as a homeschooling dad, I just wish I were as cool as Viggo. It makes me feel kinda lame. But that’s movies for you. I agree that the ending was a complete cop-out. Viggo says, “how can we readjust so the kids can have a chance to interact with society, with other people?” and apparently nobody involved with the movie could conceive of such a ‘compromise’ that continued to include homeschooling. The binary portrayal was too extreme: either you are a brilliant homeschooling weirdo running around naked in the woods, or you are part of society and go to school. No middle ground. Either crazy fantasy or giving up and giving in and everybody go sit through public school. Could they not have ended it with a homeschool coop?